Cardiff City bolstered their play-off push with a battling win at Selhurst Park to send Crystal Palace deeper into the Championship relegation mire. 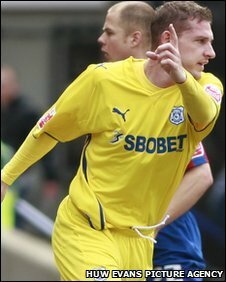 Gabor Gyepes' first goal this season, a tap-in from Peter Whittingham's low corner, gave Cardiff an early lead. Clint Hill had hit the Cardiff crossbar in the first-half but the Palace man levelled just after the break as he headed in Darren Ambrose's corner. 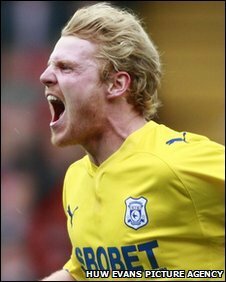 Cardiff's Chris Burke's 10th goal this season - a sweet half-volley - won it. The Bluebirds' triumph at Selhurst Park was their third league victory in four games to move the Welsh club to fourth place in the table and give them a comfortable play-off cushion. 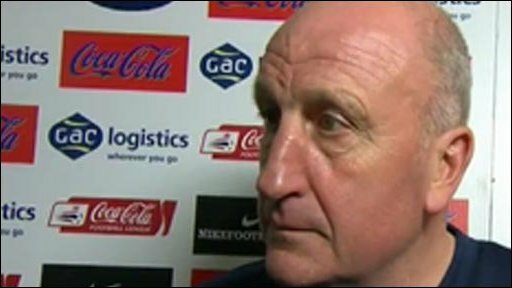 But Palace's third defeat in four games - extending their winless run to six games - means Paul Hart's strugglers remain in the bottom three on a miserable run that a side in desperate need of points could do without. Gyepes had given Cardiff the early advantage when Palace failed to clear a low Whittingham corner, flicked on by Stephen McPhail, and the big Hungarian international slid the ball left-footed into the near corner from close range. The 28-year-old's third career goal gave Cardiff the edge in the battle of the Championship's cash-strapped clubs as Palace were docked 10 points for going into administration in January while the Bluebirds have until 5 May to pay a £1.9m tax bill or face being wound-up. Yet the hosts reacted positively to going behind and rattled David Marshall's crossbar inside the opening 20 minutes as Clint Hill's looping header from Darren Ambrose's deep right-wing free-kick had the Cardiff keeper beaten. But Marshall was at his best when Darcy Blake inadvertently headed into Ambrose's path. The former England under-21 international volleyed goalwards but the Scotsman made a superb one-handed point-blank save at his near post. Ambrose went close again moments later but his 15-yard lob dropped over Marshall's goal. Cardiff had been dominated by Palace since their fourth-minute opener but returning striker Kelvin Etuhu - playing his first game since December, in for the suspended Jay Bothroyd - should have doubled the visitors' lead. Michael Chopra's flick set the on-loan Manchester City striker free but Etuhu dithered and, with Hill closing in, his shot was well-saved by onrushing Palace stopper Julian Speroni. Palace had a penalty shout rejected by referee Carl Boyeson after Stern John was hauled down in the box by Tony Capaldi following an Ambrose corner. Cardiff were made to pay for their missed chances as Hill, who hit the woodwork in the first half, went one better in the second as capitalising on lacklustre Bluebirds defending to equalise. The Palace defender found space at the near post to head another dangerous Ambrose right-wing corner in at the near post for his first goal of the season. But Cardiff showed why they are serious play-off contenders as despite being second best, they scored the winner when the odds were against them. Paul Quinn headed Mark Kennedy's deep free-kick back to Burke as the Scottish winger controlled and volleyed the ball past a helpless Speroni to score his third goal in four games. The win was not quite a smash-and-grab but Cardiff, continuing their good run against Palace - now no defeats in eight against the London club - had the hallmarks of a side that look set to secure a top-six play-off place. 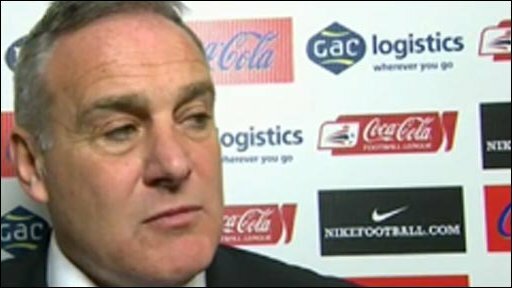 "You have to look at a blatant penalty - how it's been missed I'll never know. "And then a handball when the ball has been battered at the player from a yard. Up to that point there was only one team in it. "I think it was a magnificent performance. We are patching players up and we have kids on the bench - we are what you see. "We've got seven games to go and if we play like that we will win football matches. The players are disappointed and angry." "The ball was in the air a long time, it was difficult to get the ball down and play - and I thought we dealt with it as best we could. "At this stage of the season, sometimes you have got to win ugly." 90:00+5:47 The final whistle goes and the game is over. 90:00+5:16 Shot by Shaun Derry from outside the box goes over the target. 90:00+4:58 Peter Whittingham gives away a free kick for an unfair challenge on Johannes Ertl. Johannes Ertl takes the free kick. 90:00+3:12 Booking Warren Feeney receives a caution. 90:00+2:32 Free kick awarded for an unfair challenge on Darcy Blake by Neil Danns. David Marshall takes the free kick. 90:00+1:28 Shaun Derry takes a shot from just inside the penalty box which clears the crossbar. 90:00+1:02 Inswinging corner taken from the left by-line by Darren Ambrose. 90:00+0:41 Sean Scannell takes a shot. Chris Burke gets a block in. 90:00+0:21 Ross McCormack is ruled offside. Clint Hill restarts play with the free kick. 88:24 Substitution Michael Chopra leaves the field to be replaced by Ross McCormack. 86:09 Booking Clint Hill shown a yellow card. 85:38 Clint Hill gives away a free kick for an unfair challenge on Chris Burke. Darcy Blake takes the free kick. 82:58 The referee penalises Warren Feeney for handball. Lee Hills delivers the ball, Patrick McCarthy takes a shot. Save by David Marshall. 80:24 The referee blows for offside. Indirect free kick taken by Julian Speroni. 79:24 David Marshall restarts play with the free kick. 79:24 Substitution Wilfred Zaha joins the action as a substitute, replacing Stern John. 79:24 Stephen McPhail fouled by Patrick McCarthy, the ref awards a free kick. 78:00 Outswinging corner taken right-footed by Darren Ambrose from the right by-line. 77:32 Mark Kennedy challenges Sean Scannell unfairly and gives away a free kick. Darren Ambrose takes the free kick. 75:58 Volleyed left-footed shot by Stern John. Save by David Marshall. 73:58 Substitution Kelvin Etuhu leaves the field to be replaced by Warren Feeney. 70:56 The assistant referee flags for offside against Kelvin Etuhu. Indirect free kick taken by Julian Speroni. 70:40 Free kick awarded for a foul by Patrick McCarthy on Michael Chopra. Indirect free kick taken by Mark Kennedy. 69:15 Mark Kennedy restarts play with the free kick. 69:15 Booking Calvin Andrew is given a yellow card. 69:03 Stephen McPhail fouled by Calvin Andrew, the ref awards a free kick. 66:47 The assist for the goal came from Michael Chopra. 66:47 GOAL - Chris Burke:Crystal Palace 1 - 2 Cardiff Chris Burke finds the net with a goal from just outside the penalty box to the bottom left corner of the goal. Crystal Palace 1-2 Cardiff. 65:39 Inswinging corner taken right-footed by Neil Danns, comfortable save by David Marshall. 64:57 Michael Chopra is flagged offside by the assistant referee. Indirect free kick taken by Julian Speroni. 63:40 The assistant referee signals for offside against Michael Chopra. Julian Speroni takes the free kick. 60:56 Darren Ambrose takes the inswinging corner, save made by David Marshall. 59:56 Substitution Tony Capaldi leaves the field to be replaced by Mark Kennedy. 59:41 Foul by Calvin Andrew on Chris Burke, free kick awarded. Free kick taken by David Marshall. 57:46 Assist by Darren Ambrose. 57:46 GOAL - Clint Hill:Crystal Palace 1 - 1 Cardiff Clint Hill finds the back of the net with a headed goal from inside the six-yard box. Crystal Palace 1-1 Cardiff. 55:06 Effort on goal by Kelvin Etuhu from just inside the area clears the crossbar. 50:19 Outswinging corner taken from the right by-line by Darren Ambrose. Stern John is penalised for a handball. David Marshall takes the free kick. 46:16 Effort from the edge of the penalty area by Darren Ambrose goes wide of the left-hand post. 45:41 Shot by Chris Burke from just outside the area goes over the net. 45:10 Calvin Andrew challenges Darcy Blake unfairly and gives away a free kick. David Marshall takes the direct free kick. 45:00+1:06 The players leave the pitch at half time. 43:57 Stern John is ruled offside. Free kick taken by Paul Quinn. 42:12 Kelvin Etuhu challenges Clint Hill unfairly and gives away a free kick. Direct free kick taken by Julian Speroni. 40:38 Peter Whittingham takes a shot. Neil Danns gets a block in. 40:00 Unfair challenge on Gabor Gyepes by Calvin Andrew results in a free kick. David Marshall takes the free kick. 38:04 Kelvin Etuhu takes a shot. Save made by Julian Speroni. Michael Chopra is penalised for handball and concedes a free kick. Indirect free kick taken by Julian Speroni. 34:56 Outswinging corner taken by Chris Burke. 34:19 The ball is sent over by Neil Danns, comfortable save by David Marshall. 32:51 Unfair challenge on Gabor Gyepes by Calvin Andrew results in a free kick. Direct free kick taken by David Marshall. 30:50 The referee gives a free kick against Sean Scannell for handball. Indirect free kick taken by David Marshall. 30:18 Stephen McPhail challenges Stern John unfairly and gives away a free kick. Clint Hill takes the free kick. 28:54 Peter Whittingham takes a inswinging corner from the right by-line played to the near post. 28:12 Calvin Andrew challenges Paul Quinn unfairly and gives away a free kick. David Marshall restarts play with the free kick. 27:28 Kelvin Etuhu challenges Patrick McCarthy unfairly and gives away a free kick. Free kick taken by Julian Speroni. 26:14 Effort on goal by Darren Ambrose from deep inside the area goes harmlessly over the bar. 25:15 Shot from 6 yards by Darren Ambrose. Save made by David Marshall. Outswinging corner taken by Darren Ambrose, David Marshall makes a save. 23:03 Johannes Ertl produces a cross, save made by David Marshall. 20:00 Neil Danns challenges Stephen McPhail unfairly and gives away a free kick. Free kick taken by Tony Capaldi. 17:25 Peter Whittingham is penalised for handball and concedes a free kick. Darren Ambrose delivers the ball, Clint Hill takes a shot. 16:20 Inswinging corner taken by Darren Ambrose, save by David Marshall. 15:58 Free kick awarded for a foul by Darcy Blake on Neil Danns. Johannes Ertl restarts play with the free kick. 15:22 Effort on goal by Peter Whittingham from just outside the area goes harmlessly over the target. 14:59 Peter Whittingham decides to take the corner short. 14:10 The ball is delivered by Chris Burke. 13:32 Michael Chopra gives away a free kick for an unfair challenge on Patrick McCarthy. Free kick taken by Johannes Ertl. 12:25 Free kick awarded for a foul by Kelvin Etuhu on Clint Hill. Julian Speroni takes the free kick. 12:12 Lee Hills produces a cross, save by David Marshall. 10:53 Outswinging corner taken right-footed by Darren Ambrose played to the near post, Darcy Blake fouled by Calvin Andrew, the ref awards a free kick. Direct free kick taken by David Marshall. 10:03 Foul by Kelvin Etuhu on Patrick McCarthy, free kick awarded. Free kick taken by Julian Speroni. 6:03 Darren Ambrose takes the inswinging corner, Unfair challenge on David Marshall by Johannes Ertl results in a free kick. David Marshall restarts play with the free kick. 5:30 Michael Chopra gives away a free kick for an unfair challenge on Clint Hill. Free kick taken by Julian Speroni. 4:56 Unfair challenge on David Marshall by Stern John results in a free kick. David Marshall takes the direct free kick. 3:59 Assist on the goal came from Stephen McPhail. 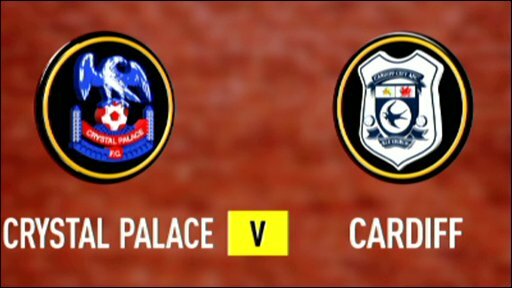 3:59 GOAL - Gabor Gyepes:Crystal Palace 0 - 1 Cardiff Gabor Gyepes scores a goal from inside the six-yard box to the bottom right corner of the goal. Crystal Palace 0-1 Cardiff. 3:35 Inswinging corner taken left-footed by Peter Whittingham from the right by-line. 1:39 The assistant referee flags for offside against Calvin Andrew. Gabor Gyepes takes the free kick.